If you want to enjoy the splendour and beauty of an English Autumn day then it’s time to check out Exbury Gardens in the New Forest, Hampshire on the south coast. It is a great family day out with over 20 miles of pathways, three woods and parkland to explore. Even the wet cannot spoil the fun – simply put on your waterproof and see a new side to Exbury! In the Gardens children can discover plants that existed before dinosaurs roamed the earth; plants dinosaurs liked to eat; a Chinese Coffin Tree and even the Devil’s Walking Stick! Exbury is also home to a Steam Railway that runs every day the Gardens are open and a special Halloween ghost train runs during late October. 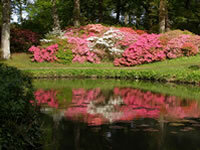 Find out more about Exbury Gardens including website details and opening times. If you liked this, check out…. Previous PostGetting Mixed SignalsNext PostWhat’s on your Family Summer Holiday Wish List?